Each phone in Zultys' IP phone portfolio is described below.See a comparison of all the key features of the ZIP-5 series family of IP phones. The ZIP 35i incorporates a 132x64 pixel graphical backlit display, 6 programmable keys, dual Ethernet ports with Power over Ethernet (PoE) and a dedicated headset port supporting Electronic Hook Switch functionality. Up to six ZIP 340M LCD Expansion Modules may be connected delivering up to 228 LCD labeled programmable keys.The ZIP 35i phone has been designed with ease of use as a priority. Dedicated and context sensitive soft keys for commonly used functions such as Voice Mail, Conference, Hold, Mute, Transfer, Redial, Do Not Disturb, Park/Pickup, Call Log and more. 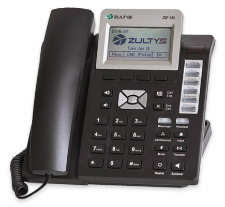 The ZIP 35i is fully compatible with Zultys' award winning MXIE Unified Communications desktop client. 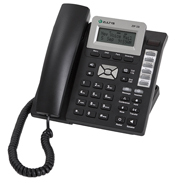 The ZIP 33i combines a 3 line display including icons, 6 programmable keys, dual Ethernet ports supporting Power over Ethernet (802.3af) and a dedicated headset port, in an easy to use, cost effective business IP phone. The phone has been designed with ease of use as a priority, incorporating dedicated keys for commonly used functions such as Voice Mail, Conference, Hold, Mute, Transfer, Redial, Do Not Disturb, Park/Pickup, Call Log and more. 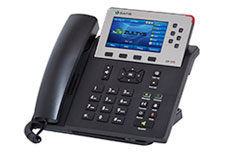 The ZIP 33i is fully compatible with Zultys' award winning MXIE Unified Communications desktop client. The ZIP 536M Direct Station Selector expansion module is designed to increase the power and flexibility of the ZIP family of phones. The ZIP 536M offers 36 programmable keys with LED lamps in a small footprint. Up to three (3) ZIP 536M modules may be installed on the ZIP 53i, ZIP 55i, ZIP 57i and ZIP 57i CT IP phones. The ZIP 536M is powered directly from its partner phone, with no additional cabling required. The ZIP 560M Direct Station Selector expansion module provides increased visibility to enhance call processing operations for users of the ZIP phones. The ZIP 560M provides 60 programmable keys with LED lamps for extensions and feature activation, and eliminates unsightly scratch-outs and changes thanks to its paperless LCD labeling system. Up to three (3) ZIP 560M modules may be connected to the ZIP 55i, ZIP 57i or ZIP 57i CT phones. Like the ZIP 536M, the ZIP 536M is powered directly from its partner phone.